This 5 day walk goes from the Southern Kawekas up over Mt Meany and through the Harkness Valley to the South Western corner of Kaimanawas. Wouldn't have rated it so difficult if the bush bashing wasn't so hefty on second day. Might be able to find an easier route (described below). Might be able to do walk with out GPS but would make it a lot easier with. First day is quite an easy 4.5 hr walk up the Ngaruroro River to Cameron Hut. Access to the river can be found at the Northern part of the Kuripapango Campsite. Walk down the trail till you get to the (locked) cableway and start walking up stream. Along the way there is a nice campsite which is a good spot for lunch. Cameron Hut • By jamiec. Licence: C.
Cameron Hut (Kaweka) • Standard Hut (DOC). Capacity: 6. This day was quite ferocious. Bush bashing through the tea tree was difficult and probably took about 9 hours or so to get to the hut. Upon reflection I would probably have gone another way such as gone straight up Mt Te Iringa after the Cameron Hut Swing bridge and followed the tracks on the peaks to the Rocky Point Hut (private) or Walked in from the road along the Tahuhunui Range. If you do go up Mt Te Iringa I think there is a dilapidated bivouac called Roberts Biv located at NZTM2000 N1881300 E5636800, and on that note from what I could see Rock Camp Bivouac (as listed on the topo maps) does NOT exist. All this being said, if you do decide to go my way, here's what you do. After leaving Cameron Hut, walk up the trail till the turn off to the left towards the swing bridge. After about 15 minutes walk you will cross the swing bridge then turn to the right and walk upstream. There is a sign here saying that you are entering private land and to contact Kahu Hikuai. Proably a good idea to call because you can also ask about staying at the private huts on the top. His phone number is 068794119. The track on the other side of the swing bridge is very poorly maintained. I would recommend walking upstream only as far as necessary to get access to the river again. Once you're on the river, walk up until you get to Raoraoroa Stream. Walk up Raoraoroa Stream for about about 200 metres where you will see a waterfall on your right. This is where things got a bit hectic. Go up the waterfall and in between the Raoraoroa Stream and the waterfall is a ridge that you will be able to follow up to the tops. I say this lightly but it took me over 7 hours of bush bashing to reach the tops. You will go over a couple of crests along the way and at 951m you change your coarse from West to North West. At this point tea tree starts to thin out a bit and it becomes a little bit easier to navigate through. Once your on the tops you should be able to see the private hut - Rocky Point. The hut is private, comfortable and easily sleeps 4. There is a table and chairs and cooking implements provided. If you were to have an lpg bottle you could get the stove fired up as well. Rocky Hill Hut • By jamiec. 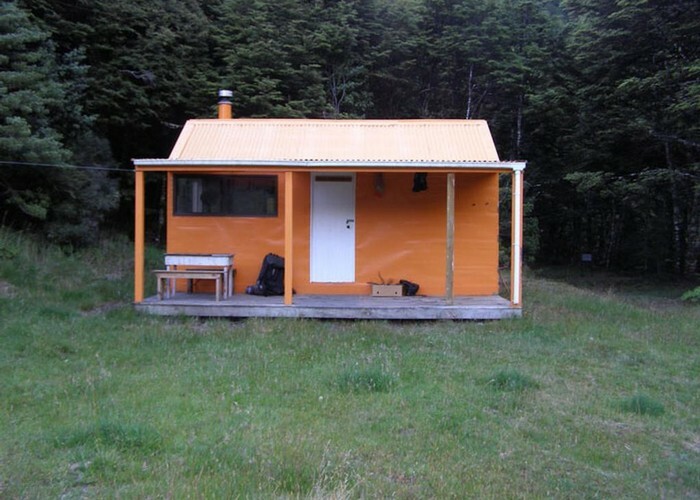 Licence: C.
Rocky Hill Hut • Private hut (PVT). Capacity: 4. This is another long day and could be broken up with a stop at either Otutu Island Hut (private & aka Mt Meany Flats Hut) or Otutu Hut. Although it is a long day it is mostly along trailed routes so is not too difficult. Start by walking across the grass lands towards Mt. Meany. If you follow the clearing to the North East of high point 1111 you will find a trail through the forested area marked by pink tape. The view from Mt. Meany is beautiful but keep away from the trig because it looks like the bees have made a nest in there. From there walk North towards the Otutu Bush. Just before you get on the trail through the forested area to Otutu Bush there is an 'island' of trees and there you will find Otutu Island Hut (private). This also sleeps 4 people and there is water supply from the roof. Mt Meany Flats Hut • By jamiec. Licence: C.
Otutu Island Hut (Mt Meany Flats Hut) • Private hut (PVT). Capacity: 4. From here follow the trail north through the native forest. The trail is well maintained and comes out in a clearing at the high point of Otutu Bush. You need to now you head East but will find some dense scrub in the way. If you look to the North of the scrub you should be able to find a trail that will lead you round the scrub and into the clear. From here walk to what is the highest point in this trail (1411 m) and turn SW. From here you can get onto the trail North down and then up a steep ridge. This is where the turn off to Ngaawapurua Hut is. The trail is no longer maintained by doc but is still quite manageable. Just follow the ridge to the North and you will eventually get down to the river where the swing bridge was removed to Ngaawapurua Hut. Ngaawapurua Hut • By jamiec. 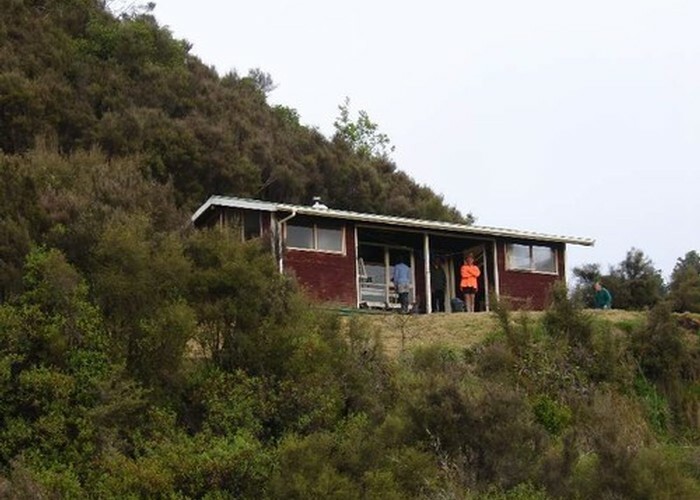 Licence: C.
Ngaawapurua Hut • Standard Hut (DOC). Capacity: 6. The trail from here is quite easy compared to the previous days. 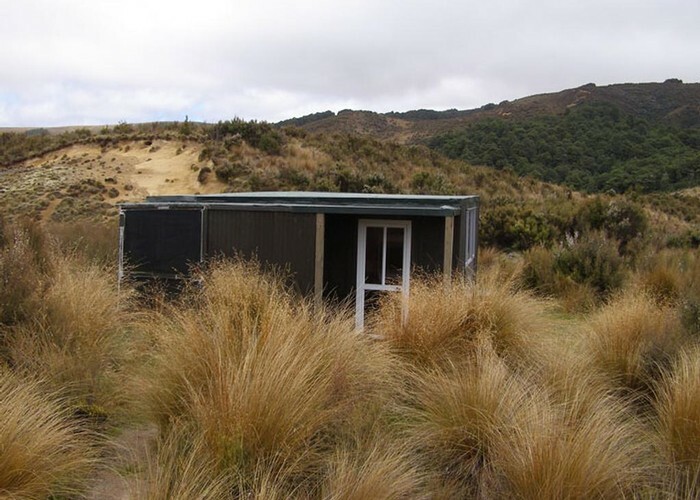 It is a nice days walk through the tussock filled Harkness Valley where you pass Harkness Hut and Tussock Hut. Tussock Hut is a good place to stop for lunch and you should reach there after about 4 hours or so. Tussock Hut • By jamiec. 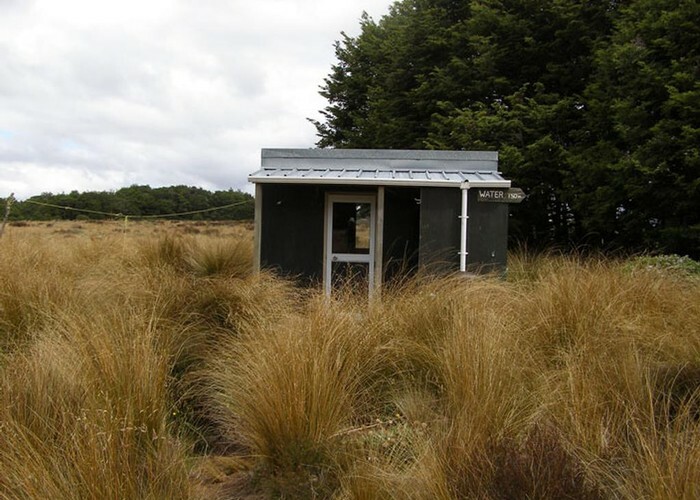 Licence: C.
Tussock Hut • Standard Hut (DOC). Capacity: 6. 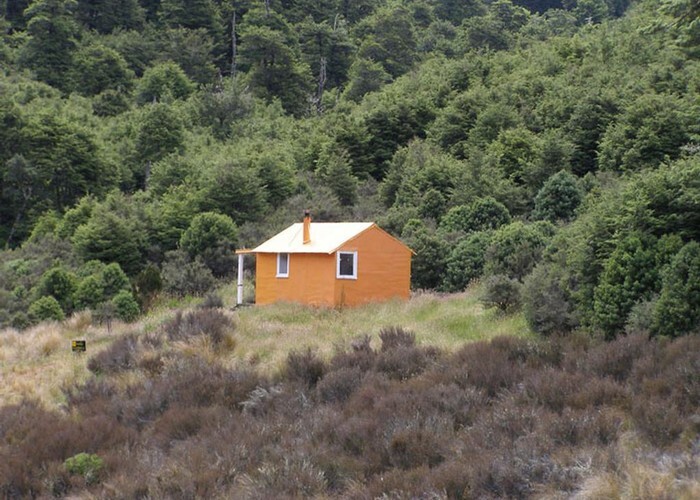 After Tussock Hut you climb up to 1254m and have a gentle descent down a ridge to the Ngaruroro River. It will take you about an hour and a half to get to the Ngaruroro River and from there another hour to get to Boyd Hut. 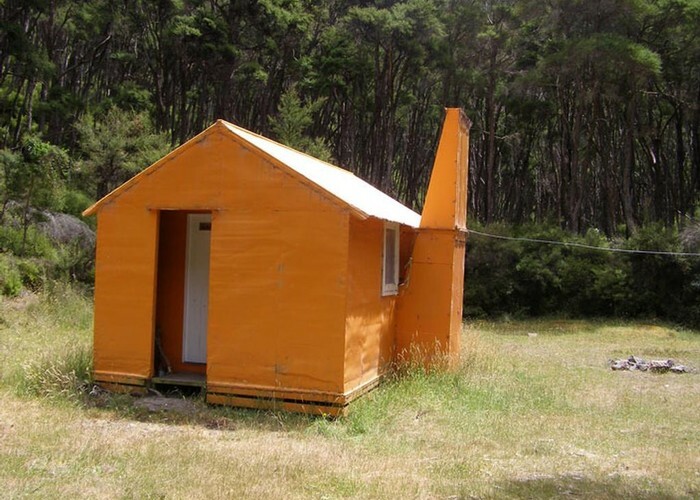 Boyd Hut is well facillitated with 16 bunks and is located beside a runway. Another option from Tussock Hut is to walk up over the Mangapapa Saddle to Oamaru Hut. There is a track that leaves Tussock Hut in this direction but the track is said to be un marked. There is a sign at the hut saying it takes about 4 or 5 hours but I would expect it to take longer than that. This is a gentle days walking down the Oamaru River Valley and out to the road end. The track to Oamaru Hut takes about 4 hours and is a good place for lunch. Oamaru Hut • Standard Hut (DOC). Capacity: 12. From there it is 4 hours to the road end where there is the public car park. A lot of the rest of the walk is along forestry roads. If you are tired and looking for a short way out you may want to follow Oamaru Road (the trail goes along that but then turns off) to the Red Hut Highway (main road to Poronui) and try to hitch out. You will probably have better luck on the weekdays for this as there will be more forestry workers about then. This might also be a shorter way (however less scenic) way to walk back as well. Added 18 January 2011 by jamiecjamiec. 4 revisions, most recently 20 August 2018 by reidpaulnzreidpaulnz. 157 views in the past year (13 per month).